Costa Teguise is a town on the eastern side of Lanzarote in the Canary Islands. It is just a 10-15 minute drive from the airport (Arrecife Airport) and therefore can easily be done by taxi thus avoiding car hire if preferred. Costa Tequise is a purpose built resort nex to the town of Teguise. It is one of the best resorts on Lanzerote and offers a mix of appartments, timeshares, villas and luxury hotels. It attracts a jet set clientele as well as tourists from around Europe. It has excellent beaches as well as lots of greenery and offers a wide range of activities both water based activities and golf, tennis etc. There are several beaches at Costa Teguise, the main one is Las Cucharas beach and is a long sandy beach. Its also a great windsurfing beach. Los Charcos beach is another sandy beach and El Jabillo beach is a mix of sand and gravel. Bastien beach is probably the best for children as it is protected from the wind which does tend to be blowing on this part of the island. The beaches are man made with fine yellow sand. The Pueblo Marinero complex, was partly designed by a local artist called César Manrique and resembles the local fishing houses of the Canary Islands. Its main square is used for markets and various cultural events. This is also one of the main areas for nightlife in Costa Teguise and has bars and restaurants as well as the shops that keep the area animated in the daytime too. As you visit Lanzarote you will become very familiar with the name of César Manrique. He was very involved in developing Lanzarote as a tourist destination but also in making sure that development is sympathetic with the beauty and original architecture of the island. A sea front promenade takse you past all the beaches and you will come to the Las Maretas Palace which was originally owned by King Hussein of Jordan and is now used by visiting VIPs such as the King of Spain. The Cuevas de los Verdes is a long lava tunnel that you can visit. A 2km section of the 6km tunnel has been opened to the public and is let to let you admire the volcanic rock flow from the inside! Over the history of the islands the tunnel has been in regular use as a refuge. Cesar Manrique developed a different part of the 6km lava tunnel and turned it into an incredible bar and restaurant calle the 'Jameos del Agua' with views over a small lake. The lake is home to a species of blind albino crabs called Jameitos which lent their name to the caves and has resulted in a lot of crab symbols in the decor. There is also an auditorium which is used for classical concerts and as a cinema. Cesar Manrique also designed a cactus garden which can be found on the north of Lanzarote. 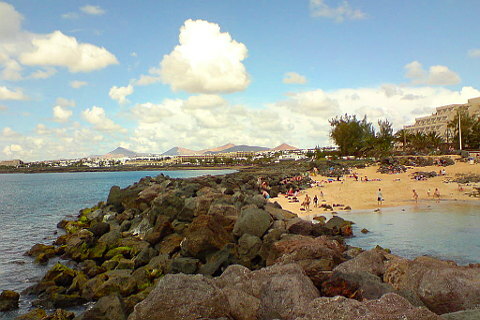 The other main resorts on Lanzarote are Puerto del Carmen and Playa Blanca. The town of Teguise, which is the capital of the Teguise municipality, is about 20 km inland of the Costa Teguise resort and has an attractive centre and a popular Sunday morning market.